Cumberland & Perry Counties Safety & Congestion Study. Review the priority congested corridors and intersections and other congested intersections with planning partners to further prioritize and provide a more detailed assessment of congestion mitigation strategies. This would include making short- and long-term improvements and proposing estimated costs. Integrate the CMP priority corridors and intersections and other congested intersections into the RTP project priority ranking process. Projects in priority areas are given high benefit and receive a higher point value. This system of ranking criteria allows projects to be prioritized based on quantitative factors, with the expectation that high priority projects will generate the most benefit to the regional transportation network. Integrate performance measures into the CMP as part of the May 2017 updated federal rulemaking (23 CFR Par 490 Subparts E, F, G, H) as required by the Moving Ahead for Progress in the 21st Century (MAP-21) Act and the Fixing America’s Surface Transportation (FAST) Act. State DOTs along with MPOs are now required to establish congestion performance measures and set targets as part of the rulemaking. HATS will work with FHWA and PennDOT to establish performance measures and associated targets through various means such as training and workshops. Analyze congestion in more detail on the limited access roadways, including I-83, I-81, I-283 and PA 581. Analyze locations from interchange to interchange and between interchanges using peak travel delay and travel time index performance measures. In addition, review the most current crash frequency and severity information, and freeway incident clearance times to better understand non-recurring congestion on the roadways. Perform additional multimodal and transit data analysis. Most CMPs rely heavily on roadway data and measure congestion based on this information. It is important to know how other modes of transportation are growing or declining. For example, data from CAT’s new real-time passenger information system can be used to better analyze peak congestion ridership level of service (LOS) for certain parts of routes, rather than for the entire route. With Vehicle Miles Traveled (VMT) increasing in the HATS region by 12 percent from 1995-2015, passenger car registrations increasing by about 15 percent over the same time period, population projected to increase by 14.2 percent between 2010 and 2040, and employment projected to increase by 20.8 percent over the same period, it is clear that congestion management needs to be a focus in planning transportation system improvements. The rapid rise in registrations, population and employment, when compared to vehicle miles traveled, indicates that encouraging transit usage, ridesharing and telecommuting may be effective. These measures should be encouraged throughout the planning period. Figure 1. 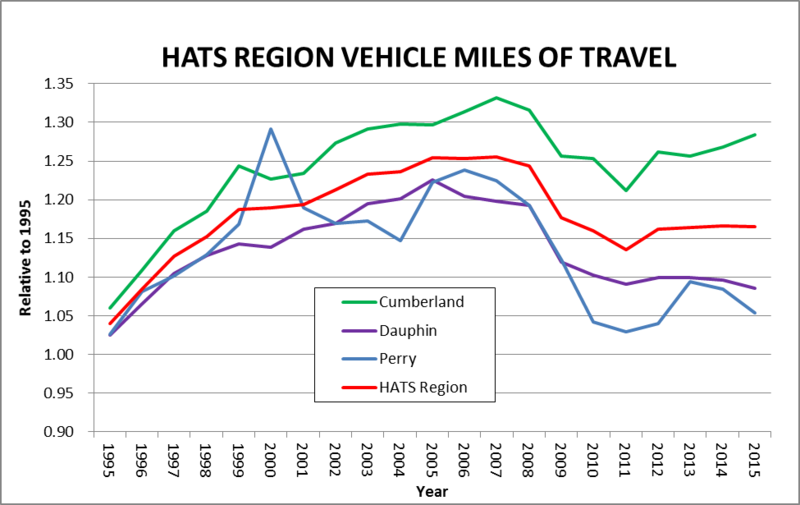 Vehicle Miles Traveled (VMT) in the HATS region for 1995-2015. Figure 2. 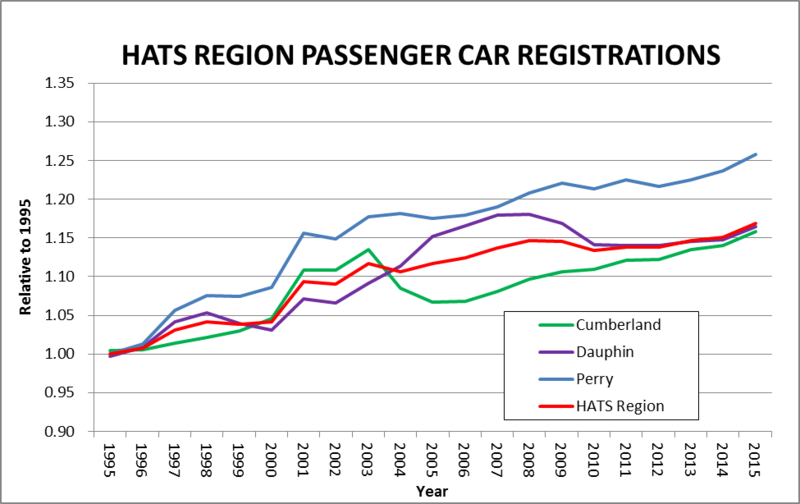 Passenger car registrations in the HATS region for 1995-2015. The MPO has a two-prong strategy for addressing congestion issues over time. The first part of the strategy involves a corridor-specific approach of focusing on areas where congestion and safety concerns are greatest and facilitating a detailed corridor plan for these areas as described under the safety section of this plan. Detailed physical and operational improvements that are identified by these studies will then be programmed as the implementation phase of such studies. In cases where congestion is identified, but not safety to the same degree, the MPO will engage in a phased improvement approach that will first look to optimize traffic operations in the corridor (access management, signal enhancements, etc.) before investing in any physical infrastructure improvements that may reduce congestion. It is important to note that some degree of congestion may be more acceptable in urbanized areas as there is more of a focus on accommodating all modes. The second phase of the congestion management approach involves improved coordination with the transit providers and Susquehanna Regional Transportation Partnership in identified congested corridors to enhance access to transit and ridesharing/carpooling/vanpooling opportunities for residents and employers. HATS is currently seeking access to employer data through the Department of Labor & Industry to enhance our ability to coordinate closely with employers in congested corridors and throughout the region. In addition, HATS is attempting to address the non-recurring congestion associated with crashes by working with local emergency management officials, municipalities, PEMA, the Turnpike Commission and PennDOT to form Traffic Incident Management (TIM) teams for the most congested and crash-prone corridors. The first group to form in 2018 is Beltway East, which includes the section of I-83 and I-81 that wraps around the city and includes Harrisburg, Swatara Township, Lower Paxton Township, Susquehanna Township, and Lower Swatara Township. The overall goal is to bring the traffic incident together to ensure events are handled quickly and safely, ultimately reducing the number of secondary crashes and injuries/fatalities. Pending the success of this initiative, additional TIM teams will be established based on need and municipal support. Establish Traffic Incident Management (TIM) teams for the most congested and crash-prone corridors.